Late last night, Google unwrapped a new feature for the Google App on Android that lets you search within apps installed on your phone. The new feature is called (fittingly) In Apps and will show up as a new “In Apps” tab within Search. What’s the point of specifying a search to within apps? 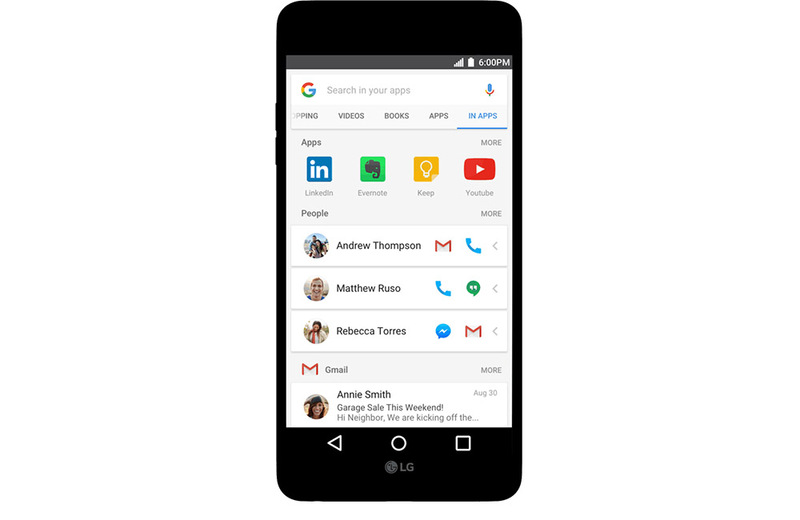 For one, this allows you to search contacts and messages on your phone from within a single interface, that being the Google App. Google gives an example of you and a friend talking about sushi last week, so a quick search from the In Apps tab for “sushi” could help you find that conversation. You could also just search that friend’s name and find conversations you have had with them throughout multiple apps, like Gmail, Facebook Messenger, SMS, etc. Or maybe you want to pull up a running list for the grocery store – you could search for “groceries” and get to it. All of this happens on your phone, by the way, so you can perform these searches even without a data connection. As of today, Google says that In Apps works with Gmail, Spotify, and YouTube, but that they will continue to add support for it “in the coming months.” The next wave of apps should include Facebook Messenger, LinkedIn, Evernote, Glide, Todoist, and Google Keep. In related news, Google continues to pump up the LG V20 for LG by announcing that their next phone will be the first with a dedicated shortcut to the In Apps mode on both the home screen and second screen of the device (second screen confirmed!). The V20 integration also means you will be able to search In Apps for pre-installed LG apps as well, alongside those supported right away by Google. Below, you can see how In Apps works on a Nexus 5 and the V20.